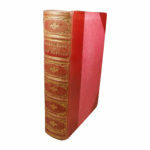 View basket “The Correspondence of Horace Walpole, Mason and Gray” has been added to your basket. 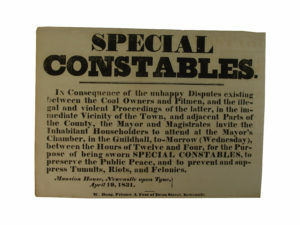 [Special Constables]. 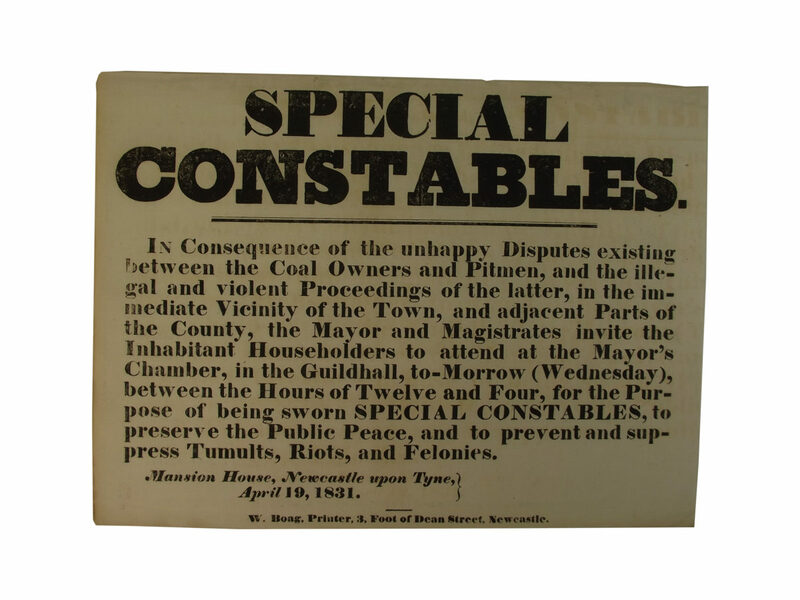 Special Constables – In Consequence of the Unhappy Disputes Existing Between the Coal Owners and Pitmen, and the Illegal and Violent Proceedings of the Latter … The Mayor and Magistrates … For the Purpose of Being Sworn Special Constables Etc. Etc. Newcastle: W. Boag, 1931. First Edition. 8vo (Oblong). Unbound. Broadside. Good+. Single sided broadside, approximately 280mm x 210mm in size. Lightly browned, especially to edges, top edge slightly creased with a couple of small nicks, remnants of paper to reverse of top edge where once tipped in to an album. An invitation to Newcastle Mansion House for the purpose of being sworn in as a special constable, “to preserve the Public Peace, and to prevent and suppress Tumults, Riots and Felonies”. 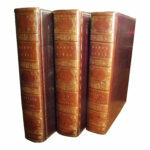 Dated 19 April 1831, the miners had already been locked out by the employers for a couple of weeks, and the dispute lasted for over two months before a twelve-hour day for boys was gained. 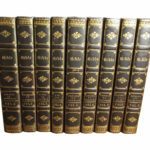 The printer W.[illiam] Boag was at 3 Dean Street from 1825 until 1838. 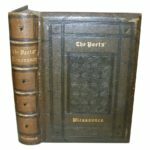 In 1825 he purchased much of George Angus’ printing materials (at auction when Angus went bankrupt), and also took over the printing of the Newcastle race cards (see Hunt, page 14).